Lajosné Kelemen, a Hungarian survivor, enjoying the Szarvas summer program with Ildikó Kiss Tóthné, a social worker from the Hungarian Jewish Social Support Foundation. 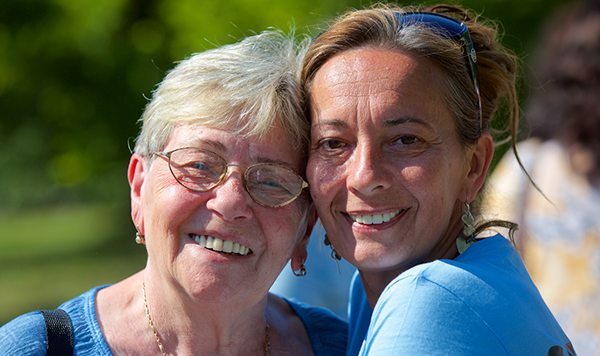 We know how important it is for elderly survivors to socialize together. For some Shoah survivors in Budapest, the arrival of summertime brings the chance to be with others in a supportive, Jewish setting. The Szarvas summer program for Holocaust survivors, run by the Hungarian Jewish Social Support Foundation (HJSSF) and funded by a grant from the Claims Conference, is a great source of joy to its participants. Survivors at the Szarvas summer program participate in a wide range of outdoor and indoor activities. 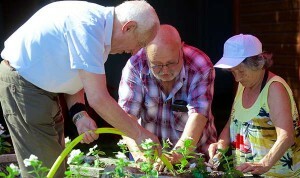 Above, Ferenc Salamon, Tamás Wachsler and Istvánné Jelinek do some gardening. Since 2012, the JDC-Lauder International Jewish Youth Camp in Szarvas, Hungary, about 100 miles southeast of Budapest, has hosted Holocaust survivors for a six-day retreat. The camp was founded in 1990 for Jewish children 7-18 years old across Central and Eastern Europe. Several years ago, HJSSF created the summer camp for survivors. This is the fourth year that Claims Conference allocations have provided this much-needed respite. Now wildly popular, hundreds of Hungarian survivors are able to spend time in the countryside, relaxing and being with friends old and new. The Nazis arrived in Hungary in March 1944. By June of that year, about 500,000 Hungarian Jews, most of whom were from outside Budapest, had been deported, primarily to Auschwitz. The majority of the Jews in Budapest – about 70,000 – were forced into a ghetto at the end of 1944, and most had survived when Soviet forces liberated that area in January 1945. It is estimated there are about 7,600 Shoah survivors in Hungary, and 90 percent live in Budapest. Approximately 3,500 survivors receive a range of services from HJSSF, funded by the Claims Conference, including homecare, medicine and medical equipment, food, emergency assistance, transportation and case management. And this year, about 300 of them are able to go to summer camp. 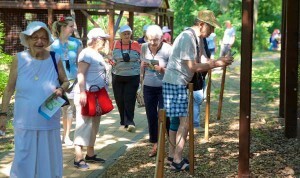 In Szarvas Senior Camp’s first year, 181 survivors participated in two sessions. This summer, almost twice that number will attend one of three sessions – a six-day session in June and in September, and a four-day stay at the end of August for those who want a shorter visit. Kati Rezsőné Perlaki and Rezső Perlaki work on a craft project. 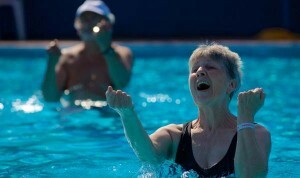 Sándorné Fehér enjoying a water excercise class. 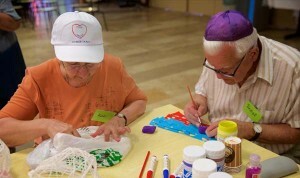 The daily schedule is filled with activities, such as arts and crafts, dancing, “Ask the rabbi” sessions, and swimming, including water exercise classes. The cafeteria is strictly kosher and there is a synagogue on the property. Survivors have told HJSSF that their visit to Szarvas is the highlight of their year. “In this year’s first Senior Summer Camp we found a note from one of our clients, which says, ‘I’ve lost all of my childhood but you’ve brought it back’. So this is what we work for,” Monika said. Taking advantage of beautiful weather, survivors at the Szarvas program took a guided outdoor walk. The Claims Conference knows that socialization programs such as the Szarvas Senior Camp are vital in keeping elderly survivors engaged in the world around them and in giving them an opportunity to be with others who have shared similar wartime experiences. We will continue to bring these summertime programs to elderly survivors, who can now experience what was robbed from them in their youths.